(Photo by Alicia Donelan) Ethel Thayer (Pat Bowie) tries to get through to her husband, Norman (John Felix) in Palm Beach Dramaworks' staging of On Golden Pond. (Photo by Samantha Mighdoll) Ethel Thayer (Pat Bowie) and Norman Thayer (John Felix) enjoy a moment in On Golden Pond. 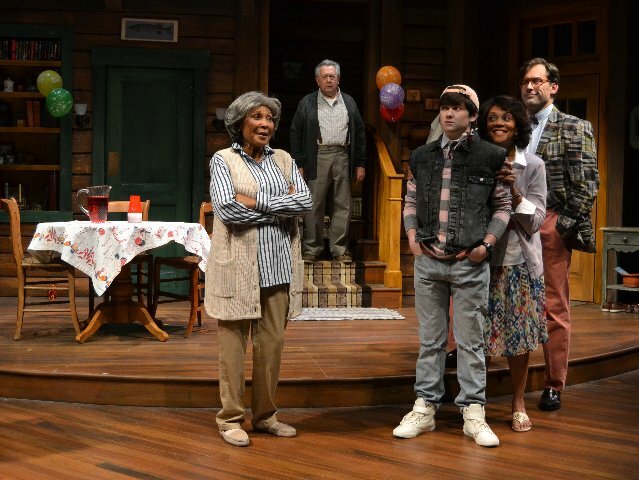 (Photo by Samantha Mighdoll) Norman Thayer (John Felix, back) decides to remain alone while his long time wife, Ethel (Pat Bowie), engages family and friends in On Golden Pond. If you were to read the 1979 classic, beloved play On Golden Pond, it might seem easy to lump long-married husband and wife Norman and Ethel Thayer into two neat, black and white categories. Norman, you might reasonably conclude, is a pessimistic man on the verge of turning 80. He harbors a cynical view of life, is likely deteriorating into dementia, suffers heart palpitations and feels his time on earth is all but over. He is basically waiting to die. Ethel, on the other hand, is 10 years younger and realizes she’s getting older. But she doesn’t let that stop her from maintaining an infectious zest for life and living. She, unlike Norman, is an optimist, appreciates the little things in life and believes her “golden years” are really that – golden. But in Palm Beach Dramaworks’ strong and nuanced production of Ernest Thompson's funny, touching and thought-provoking play, which runs through Feb. 25, Norman and Ethel don’t merely fall into those all black and white categories. One thing that impresses about this production, which is set in 1988, is the complex characterizations that performers Pat Bowie (Ethel) and John Felix (Norman) convincingly created, under Paul Stancato’s sensitive, detailed direction. Any actor playing Norman, or any curmudgeon, is presented with a challenging acting assignment. He needs to convincingly endow his character with orneriness, irritability and at least a hint of a short temper. At the same time, the actor can’t turn the character into a mean-spirited, rotten old man with no potentially redeeming qualities. If he does, it will be easy for audiences to hate him and not care – or even stick around long enough – to witness any transformation the fictional person goes through. There’s definitely a marked contrast between Felix’s Norman and Bowie’s Ethel. His expression is often marked by a long, melancholy face. Norman sometimes walks with his head down and moves slowly, with a slight expression of exertion. This curmudgeon sometimes lowers his eyebrows in annoyance and irritability. During other moments, he raises them, betraying an intensity of expression. Bowie’s Ethel, on the other hand, has a spring to her step. She even jogs jauntily across the stage. In this portrayal, Ethel speaks in a joyful, loving manner. She possesses a spirited, even spiritual quality. After this sprightly senior citizen hears the music-like sound of loons, she sounds happy. But Ethel also sounds as though she’s thanking the Lord for creating the creatures. 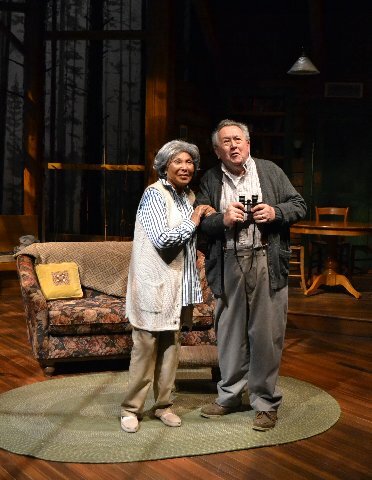 The older woman’s personality in PBD’s production sparkles like the bright sun would on a clear, inviting day outside the couple’s summer home on Golden Pond in Maine. In a multi-faceted performance, though, Bowie shows another side to her character. At times, she turns Ethel into an exasperated, irritated woman, reinforcing the fact that she’s a flesh and blood human being, faults and all. This same characteristic is evident in Felix’ performance. There are certainly times you’d like to keep your distance from Felix’s morbid-sounding, cynical and grouchy Norman. However, the actor finds the man’s soft spots. The long-time Sunshine State performer makes it abundantly clear that his character sincerely loves Ethel, his wife of several decades, with all his heart and soul. There’s also a pep in Norman’s voice when, for example, he examines classified advertisements in the newspaper. With enthusiasm emanating from his voice, he’s wondering how he might put his time on earth– however much of it he might have left – to good use. One might expect someone with Norman’s preoccupation with death and defeatist attitude to put only negative spins on situations. Nevertheless, when the play’s curmudgeon takes a book he’s read off the shelf, he does the opposite. Sure, Norman might have forgotten the story with a dementia-like illness taking over his mind. “But my mind is going, so it will be all new to me,” Norman says brightly. Also, how can you explain this man bragging about himself when he possesses such a bleak outlook? Felix conveys vulnerability when necessary, but also invests the character with an outer toughness, perhaps hiding his inner fear of growing infirm and dying. Credit the actors and their director for finding different shades to the characters and staying away from sentimentality. Felix and Bowie display great chemistry on stage, convincing us that Ethel and Norman have been a long, happy and loving couple. The latter might be a louse at times, but he’s loveable; it’s easy to see why Ethel has remained with him for so long. As Ethel, Bowie sometimes acts annoyed toward Norman. But it’s an annoyance rooted firmly in her familiarity with her long-time hubby. Ethel repeatedly refers to Norman as “You Poop,” sometimes in a loud voice. Deep down, though, it’s clear that Ethel means it in a loving, tender manner. The play takes place during the 48th straight summer the couple have spent in their idyllic home, surrounded by nature. Scenic designer Bill Clarke, using wooden supports, has lent a rustic, historic and cozy aura to the home. Colorful, wide sofas lend an extra sense of comfort. Clarke has designed the home realistically, but not literally. It’s not an enclosed set; it’s open to the breathtaking outdoors, which lighting designer Donald Edmund Thomas has bathed with eye-catching diversity. The lighting lends a beauty to the set and suggests different times of day. Sound designer Brad Pawlak, meanwhile, has created evocative, peaceful sounds. Norman and Ethel have enjoyed many happy summers at their summer home. This year, however, there’s palpable tension in the air. Not only is Norman losing his memory, but the couple’s estranged daughter, Chelsea, is coming to visit. She’s had a strained relationship with her dad, whom she has called “Norman” ever since her childhood. Dad, meanwhile, is hardly happy that Chelsea doesn’t have children. At the time of the play, she’s 42, past her child-bearing years. She’s divorced her husband and arrives with her boyfriend, Bill and his 15-year-old teenage son, Billy, in tow. Chelsea is determined to reconcile with her father. He’s on the verge of 80, suffers health issues and is losing his memory. Will it be too late? 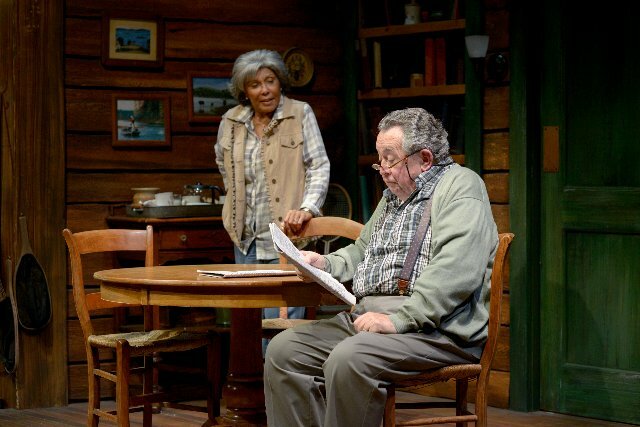 On Golden Pond is about the attitude one takes toward life and aging, but it’s a layered play. The story also centers on strained adult offspring-aging parent relationships, reconciliation, the importance of conversing with and listening to people and bridging the generation gap. Karen Stephens offers an emotionally-powerful performance as Chelsea. Every word coming out of the actor’s mouth sounds sincere and spontaneous. The character sounds assertive without Stephens’ performance feeling forced. As young Billy Ray, real-life teen Casey Butler acts a bit tentative in the beginning, but loosens up considerably, befitting his character. He plays the youth as a fun-loving, rebellious boy whose unabashed quality appeals to Norman. Butler’s Billy calls to mind a Huckleberry Finn-type character. Paul Tei shines as Charlie Martin, a mailman who had considered marrying Chelsea. Tei, in a performance blessed with humor and an impressive natural quality, nails his character’s laid back, charming demeanor. On Golden Pond features relatable, likeable characters and lively dialogue. Thompson demonstrates an impressive ability to leaven dark, uncomfortable moments with comedy. it’s no wonder the play has remained popular since its 1979 Broadway opening. With the piece’s fusion of comedy and pathos (there are plenty of one-liners), Neil Simon comes to mind. Strained aging parent-adult offspring relationships might suggest an Arthur Miller play. The play’s emphasis on life’s preciousness reminds one of Thornton Wilder. It’s hardly a surprise that On Golden Pond has enjoyed the success it has; it’s played 40 countries on six continents and been translated into 30 languages. It certainly falls into the category of “theater to think about,” which is Palm Beach Dramawork’s slogan. One can only imagine how much more powerful the play would’ve been had Chelsea witnessed her father’s heart attack at the end…and tearfully reconciled with him right after, realizing his time is short. On Golden Pond continues through Feb. 25 at Palm Beach Dramaworks’ intimate Don and Ann Brown Theatre, 201 Clematis St., West Palm Beach. For more information, visit www.palmbeachdramaworks.org or call (561) 514-4042.